Painting, my favourite pastime, Yeah right! Painting is not one of my favourite jobs and fiddly painting is at the bottom of the list, or maybe even lower down than that. The thought of painting something as complex as the Aztec Calendar is probably off putting to many people who have looked at making one. Who can blame them. It's a large and fiddly thing to paint but not if you know how. What would you say if I told you I painted this with a 1" paint brush and no sanding or masking was required? Painting time was just 30 minutes from starting to put the black onto the calendar to being finished. Thank you to all the members of the Joes community for sharing with the rest of us how to finish our projects because this is something our machines can't do. Not yet! The first job is to seal the MDF to prevent the paint soaking into the surface especially where it was machined. I find that Shellac works well for this and both hardens the MDF and seals it. I used Shellac flakes disolved with methylated spirits but you buy it premixed if you prefer. Any sealer can be used for this job but I like shellac because it soakes right in so no build up in the engravings and it drys very quickly. You can buy it locally or on line and the best part of shellac is you can buy it in dry form and bix it up as you need it. It is availabel from Amazon as well as other retail outlets. 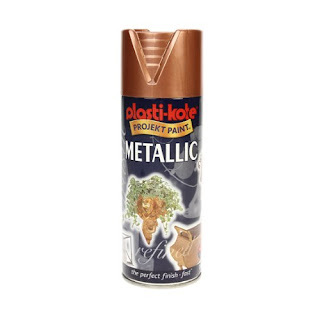 Beware there is a brighter vrsion of the copper paint in the Plasti-kote range and you want the dark copper collor shown here if you want it to look like mine. There is nothing stopping you deom using other colors as well so be creative and have fun. The final paint use was Resene Lumberside. This is a lowsheen acrylic paint made for use on exterior surfaces and is the same paint I use for my yard art. Realistically any acrylic paint will do but I recommend matt or lowsheen for this job as gloss would overwhelm the finished product. Seriously don't use gloss for this. Ideally you need to be working in a cool enviroment to slow down the drying of the black paint. Alternately add a how weather additive to the paint to slow it down and give you time to work. Don't over do the additive as it makes the paint froth or at least mide does. Start by doing small areas and then increase the area once you see what can be comfortably be done at one time. Keep the surface copper you want exposed as clean as possible and if you have too go over it with the Methylated spirits as you go if it is drying too fast or you really need to clean the surface. I next wiped it with a dry cloth to remove remaining surface paint but it will still leave a little remaining. Using dry paper towel l leberated from the kitchen, (don't tell Mrs Nutz), I wiped the surface of the calendar. The paper towel is wrapped around a sanding block and rubbed over the surface. It does a surprisingly good job of removing the remaining paint. Clean the surface with Methylated spirits. This will remove acrlyic paint but not affect the spray paint. There are limits to how well Methylated spirits will work so don't expect it to work miracles. It will remove a thin film of barely dried paint but if you slap it on, let it dry and try to remove it later then good luck. It is best to keep the surface as clean as possible as you go. Don't expect the copper paint to retain its original lustre. The black paint will leave a fine film on it that will not come off and this is fine, even desirable. It gets rid of the shine and gives it an aged look which is what you want for a calendar meant to be from an ancient civilization. Painting something so complex was never so easy and looked so good. It is amazing the level of detail that remains using this technique. I hope you enoyed this video and will give this finishing technique a try. Great looking Project would love to try it out . Any chance of supplying the file for calendar. Hi Peter my name is John from Melbourne Australia I came across your videos and I gotta say I just love them. I have 690 cnc machine with artcam software. 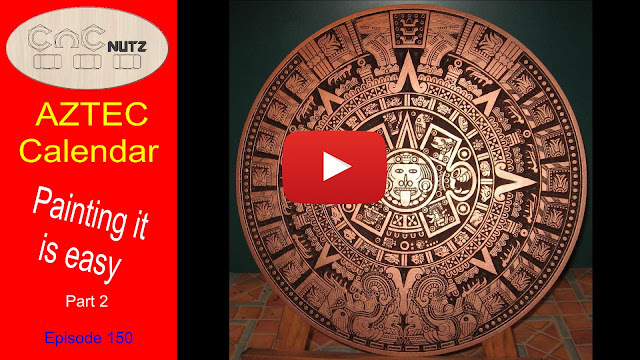 With your Aztec calendar which looks fantastic when I did put it into my artcam I went as far as putting bitmaps to vectors but when I try to simulate toolpath I couldn't do it. Is there a way DXF and VCrve convert to STL. I would really appreciate if you could help me out here Peter. There's a freeware application called Blender that will import / export many different formats including STL. There is a learning curve with it as it's quite complex package but it will do what your asking for. Alternatively using Artcam, since you created a Bitmap you could save it then import it as a relief and create a machine relief toolpath.